Are you modifying assessments to meet the needs of all of your learners? Do you need a way to document these modifications and communicate the changes you've made to parents? Then this checklist is for you! 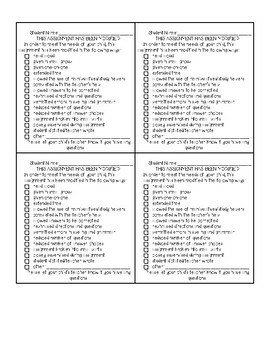 I created this checklist to staple to the front of any graded papers/quizzes/assignments/tests. It is a quick and easy way to show parents and other stakeholders what modifications are being made to the general curriculum. There are 14 modifications listed as well as space to write in your own if it is not on the list! This might also help you to remember what modifications are available and easy to implement!